I have had the opportunity to visit the Neve Glacier on eight occasions, it is not easy to get to. In the North Cascades it is one of a handful of glaciers with a large higher elevation accumulation zone, that is not on a volcano. The glacier feeds Diablo Lake, part of the Skagit River hydropower system. 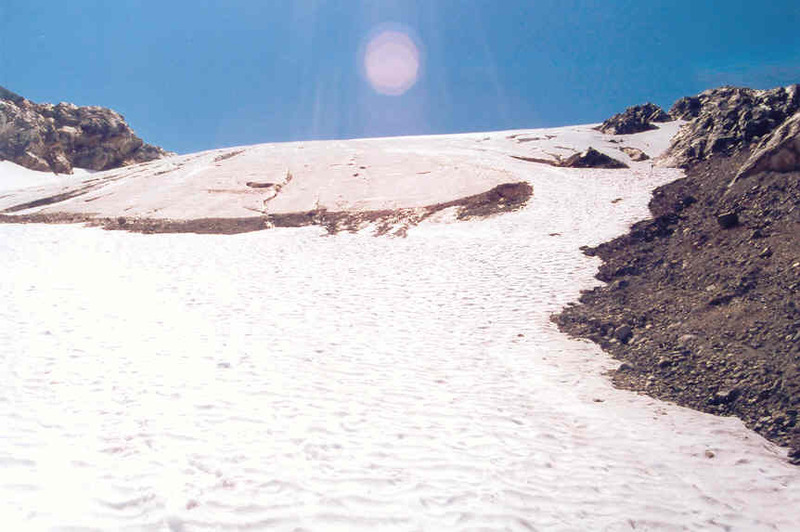 The terminus of the glacier in 1975 was in basin that receives considerable avalanche deposition slowing the retreat. 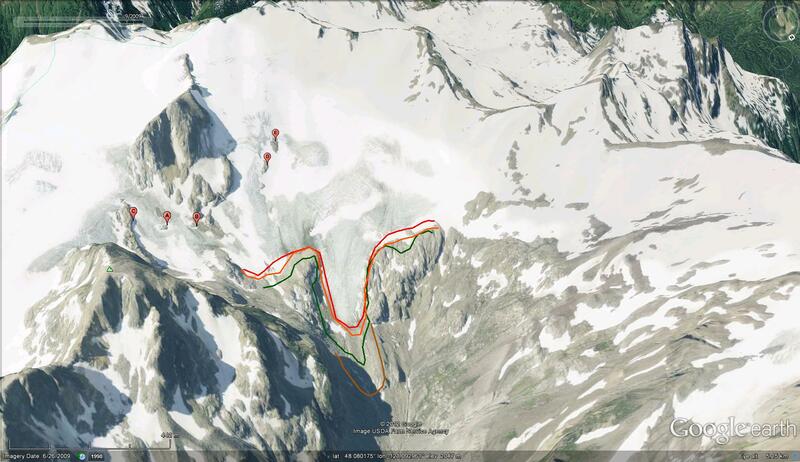 In this post we focus on the thinning of the glacier leading to expansion of bedrock exposures at four locations above the former terminus, that by 2011 had led to this low lying basin being dynamically cutoff from the upper glacier. In each image the red letters A-D are located in the same spot, and the purple arrow on the Google Earth images indicates the terminus position. 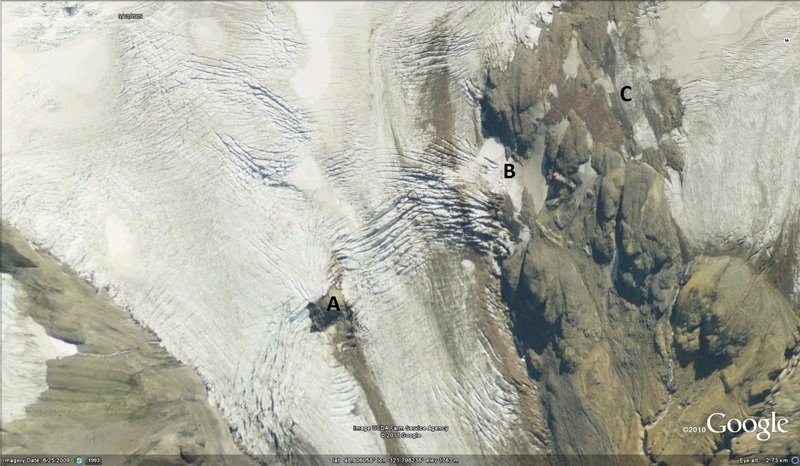 The first image is an aerial view of the glacier from Austin Post, USGS from 1975: at point A there is a quite small exposure of bedrock, at Point B and C there is a good connection of feeder glaciers from the higher slopes to the main valley glacier. At Point D there is continuous glacier cover. 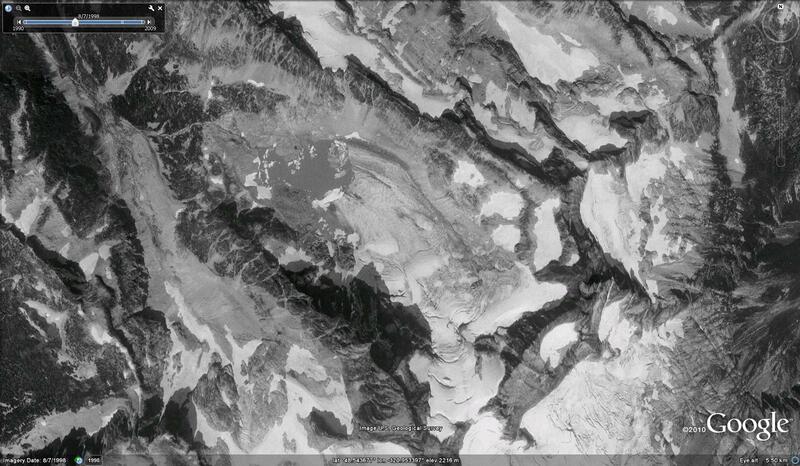 This was the case during my first two visits to the glacier in 1985 and 1988, second image. 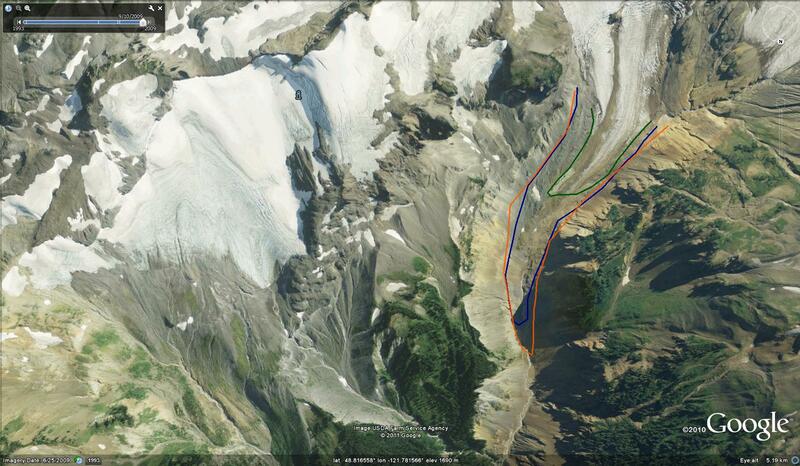 The third image is from 1990 and reflects limted change from 1975 as well, the blue arrows indicate glacier flow.
. By 1996 notable thinning of the glacier was apparent adjacent to Point A, in 2001 and 2002 the thin nature of the ice around the bedrock at Point A is evident.
. 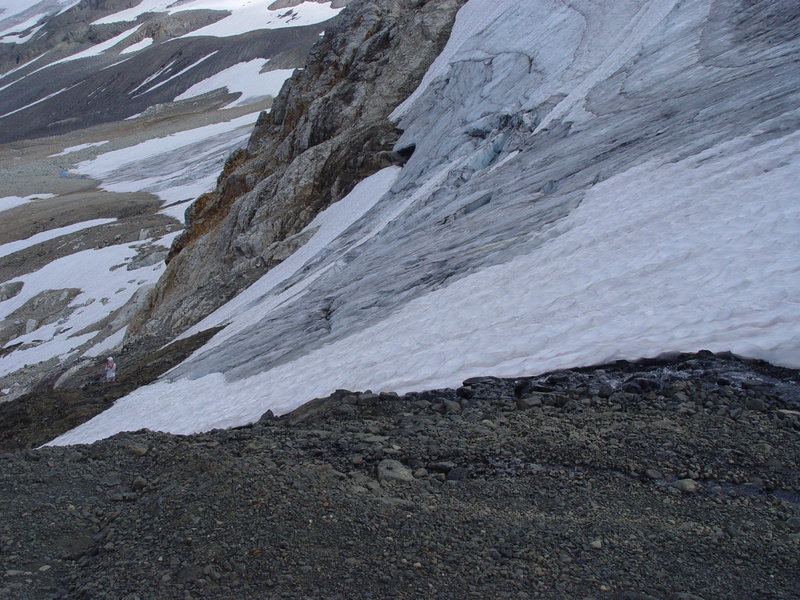 The accumulation zone of the glacier around Point B and D in 2001 indicates no bedrock exposure at D and a connection of the upper glacier at Point B; however at Point D in 2009 the large new bedrock areas that have resulted from thinning has occurred. A comparison of the Google Earth imagery from 1990, 2006 and 2009 indicate the expanding bedrock at each Point. 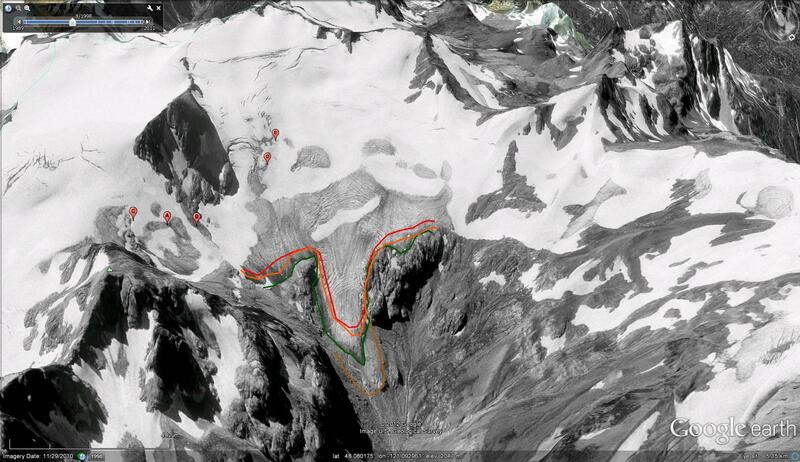 A closeup of Point A from 2009 has the bedrock delineated with red dots indicating that the left arm of the glacier that formerly encircled Point A, now ends above Point A and that the right hand arm is only 35 m wide and despite the steep slope has no crevassing and is stagnant. 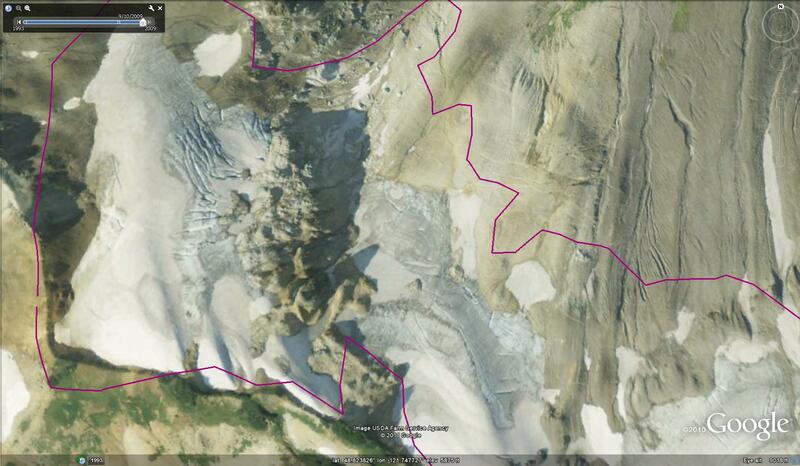 At Point B the upper glacier no longer reaches the main trunk. At Point C the connection to the main glacier has decreased by 50% in its width from 140 m to 70 m, and at Point D several large bedrock areas have emerged. 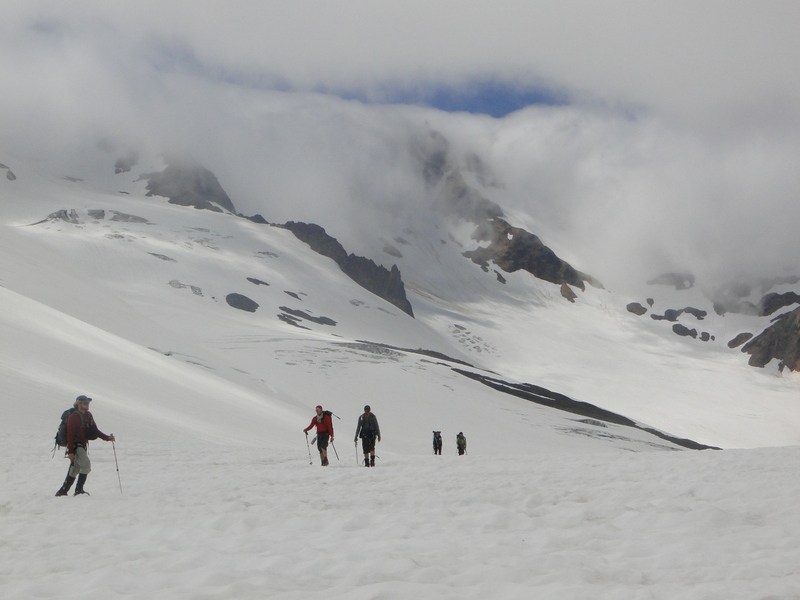 In 2013 or 2014 the upper glacier will likely separate from the former terminus region below the Point A bedrock region. 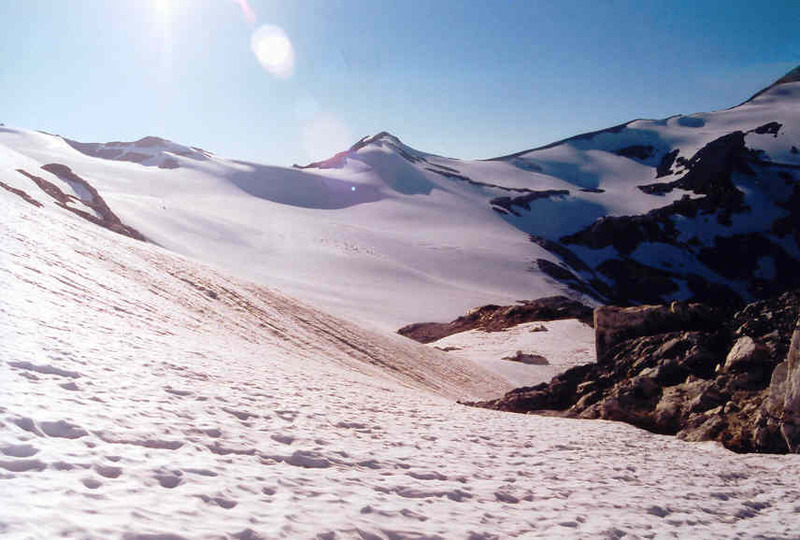 The thinning of this glacier is typical of North Cascade glaciers (Pelto, 2007), though the retreat has been unusually small (Pelto, 2010). C.E. Rusk in 1906 hiked right to the terminus of Suiattle Glacier, which is labelled Lion’s Paw in Rusk (1924). The glacier had retreated 1400 m since its Little Ice Age maximum and based on the lack of reported brush below the glacier, this retreat had occurred primarily in the previous 30 years. 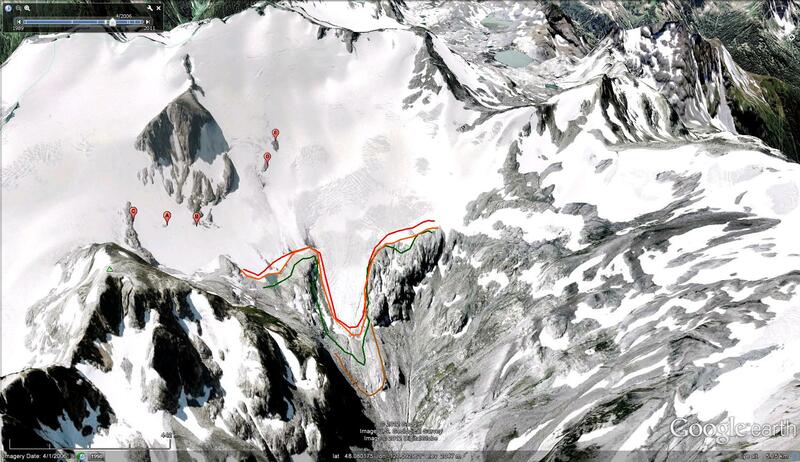 By 1940 the glacier had retreated another 900 m back to within 120 m of its current position. Suiattle Glacier retreated more from its LIA maximum than any other glacier in the area, probably due to the low slope of the Suiattle Valley, from 1550-1700 m, down which the glacier had advanced. 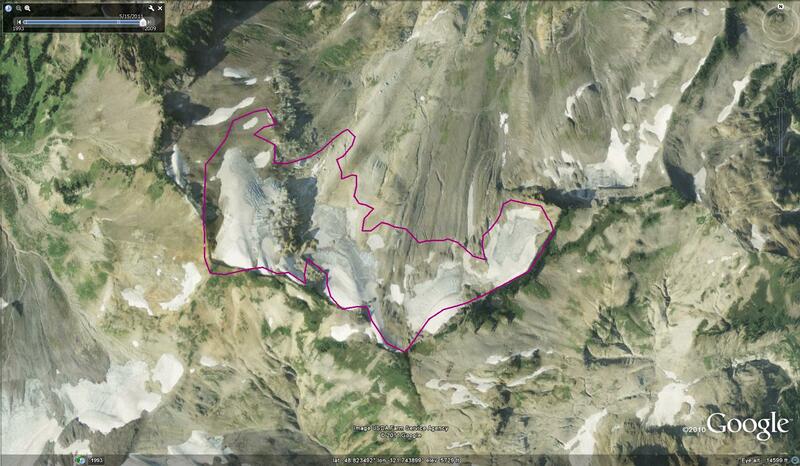 Rusk, noted the lack of any terminal moraine near the end of this glacier, this was unusual in his experience. In other words typically in this period a terminal moraine was not too distant from the current termini position. This glacier had already retreated so far that the terminal moraine was not only well down valley, but buried by aggrading sediments from the glacial stream. 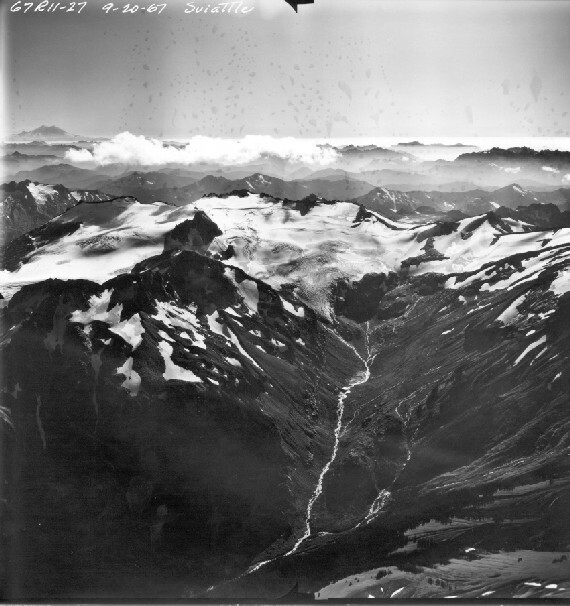 This retreat continued until 1967, below is a 1967 photograph of the glacier from Austin Post (USGS). 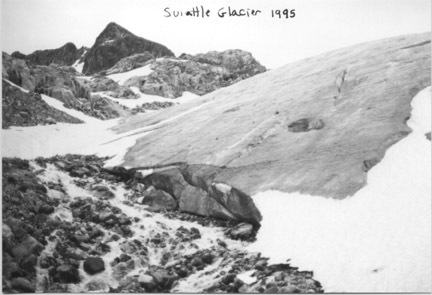 Between 1967 and 1979 Suiattle Glacier stopped retreating and began a small advance. Suiattle Glacier advanced 15-20 m during the 1970’s. Our visit in 1988 to the glacier indicated retreat had just begun, and by 1995 the glacier had retreated only 28 m from 1988 to 1995 (top image). The retreat than accelerated with another 150 m of retreat by by our 2002 survey. 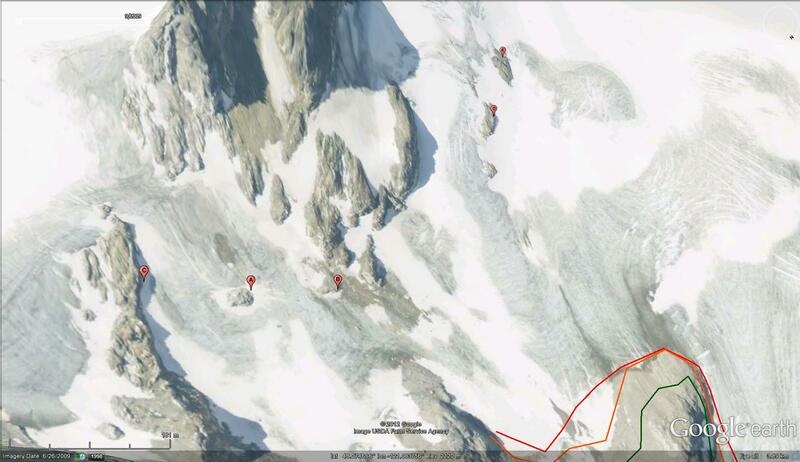 The terminus remained crevassed steep and convex through 1995 forcing us to the eastern margin to reach the terminus. By 2002 (second and third image) the terminus was no longer that steep or crevassed and we could walk right down the middle. 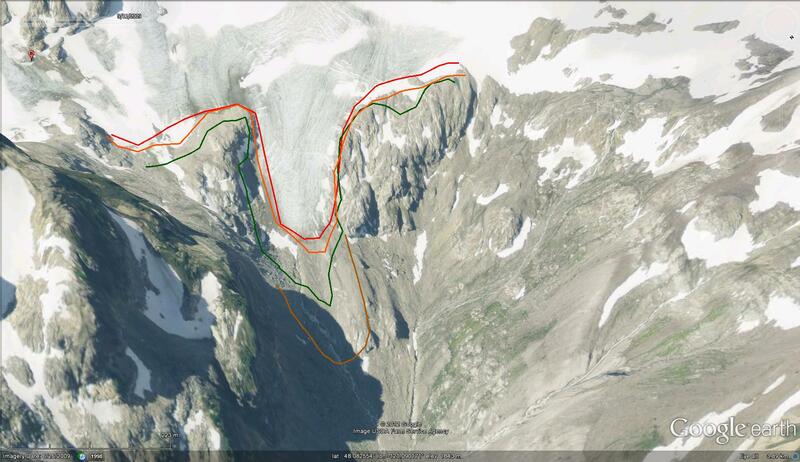 The overall retreat of this glacier as seen in the Google Earth imagery sequence of 1998, 2006, 2009 and 2011 indicate the retreat with the brown line being the 1985 terminus, the green line the 1998 terminus, the orange line the 2006 terminus and the red line the 2009 terminus. Total retreat from the advance moraine of the 1970’s is 270 m. What is a more important reflection of the is glaciers current state is the thinning that is apparent. Outcrops of rock are emerging as the glacier thins even well above the terminus (A-E). The majority of the outcrops are on the eastern side of the glacier. 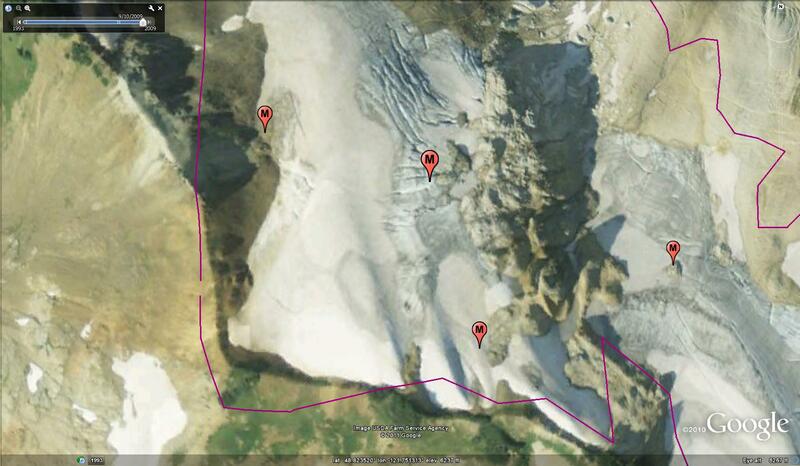 Even after a year of good positive mass balance for the glaciers in 2011, the outcrops remain exposed. The upper portion of the glacier appears robust still. Unlike its counterpart over the glacier gap on its western margin where the west arm of the Whitechuck Glacier melted away. On Suiattle Glacier in 2002 we undertook a detailed ice worm study, setting up six square meter plots and counting the ice worms. 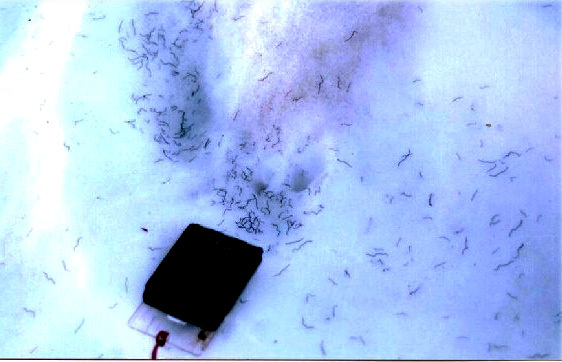 The recorded mean density was 1800 to 2600 ice worms per square meter in 2002. With an area of 2.7 square kilometers, this represents 5-7 BILLION ice worms on this glacier! This is comparable to the earth’s entire human population on just one glacier. Good thing they do not use many natural resources each. This is also the highest population we have identified in the North Cascades. The picture below is from this survey, the quality is tough because they only come out in low light and this was prior to having a digital camera. 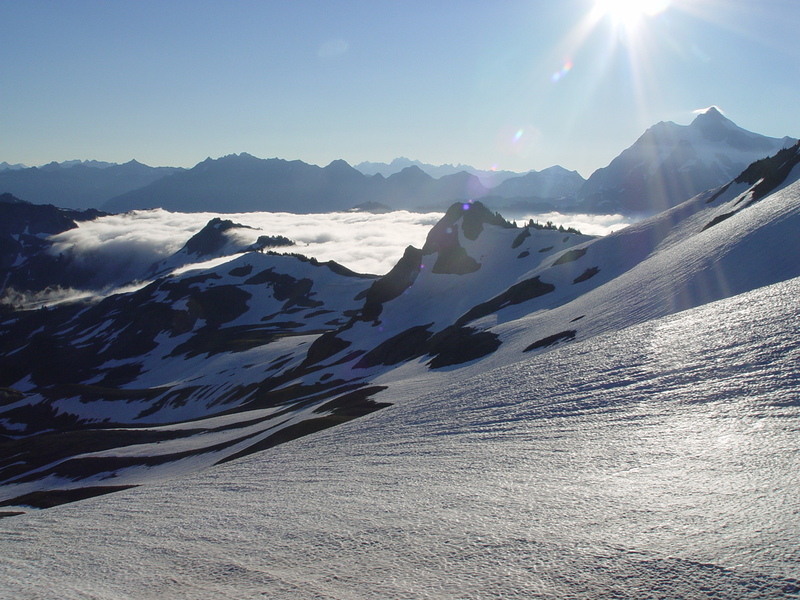 Ptarmigan Ridge Glacier is nestled on the north side of Ptarmigan Ridge in the North Cascades of Washington. This is a small glacier that has been retreating and has separated into several smaller glaciers over the last 20 years. 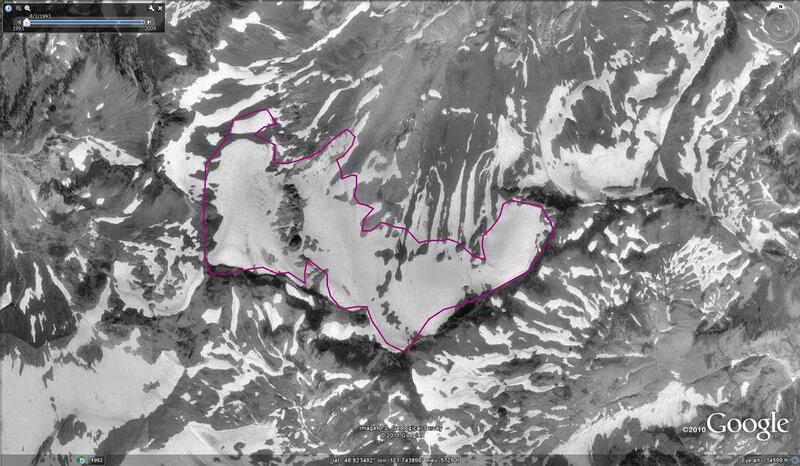 From 1984-2010 we have visited this glacier every year assessing the terminus in half of those years, in others it has still been buried by snowpack. The main terminus has retreated 120 meters. Given the total maximum glacier length is 360 m in 2010, this is a substantial loss. 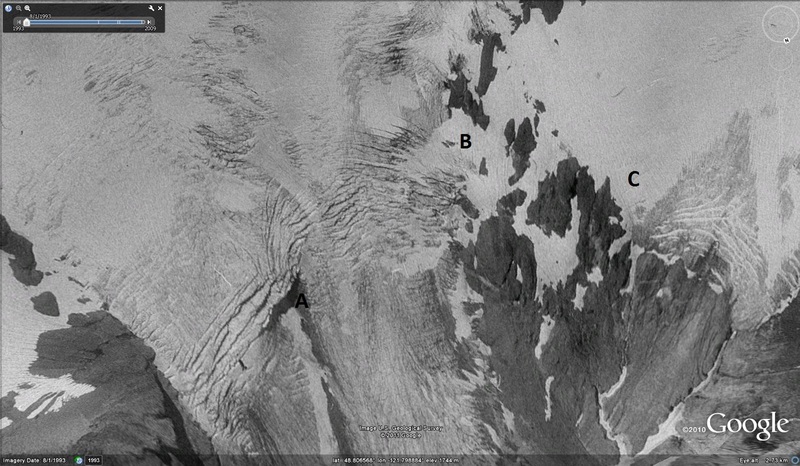 The sequence of images below indicate the retreat from the top a map based extent 1979, to a 1993 USGS aerial photograph middle, and the 2009 satellite image from Google Earth. 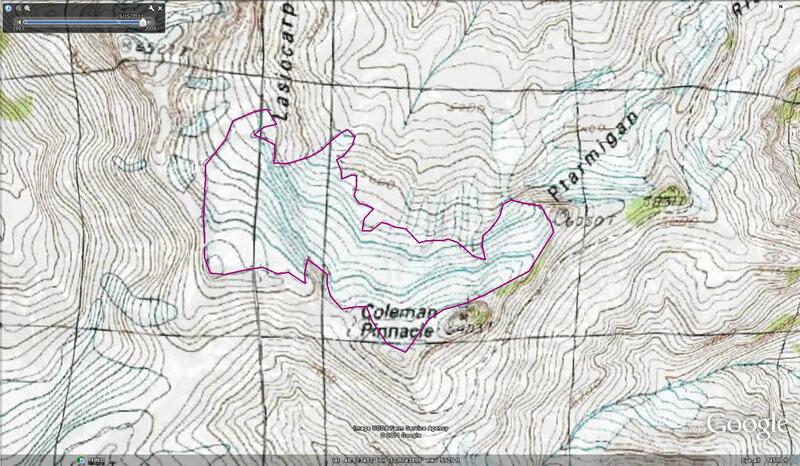 The glacier boundary from the map is in magenta. . The glacier retreat has been associated with an earlier melt out of this alpine region in general. 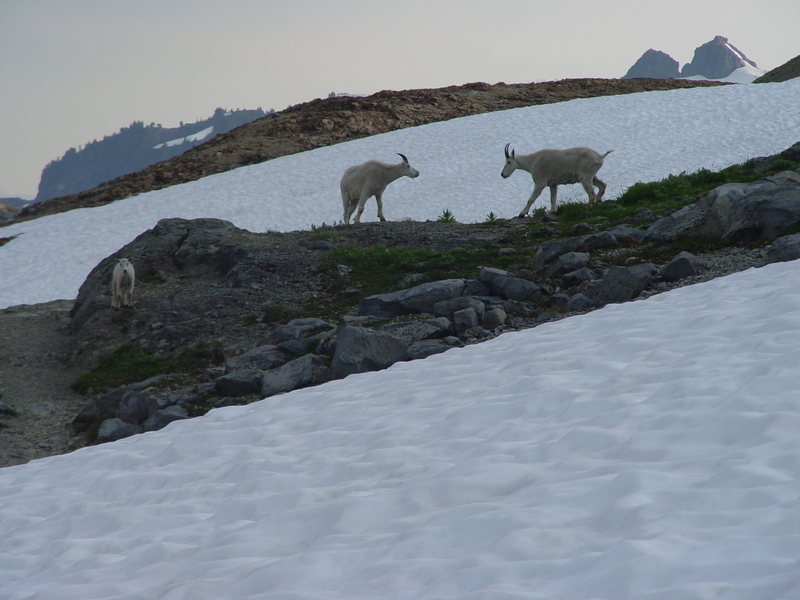 This has been beneficial to the local mountain goats with a sharp population rise after 2002. We do a mountain goat census here every year at the request of the United States Forest Service. Despite the population increase along the ridge there is no sign of overgrazing. 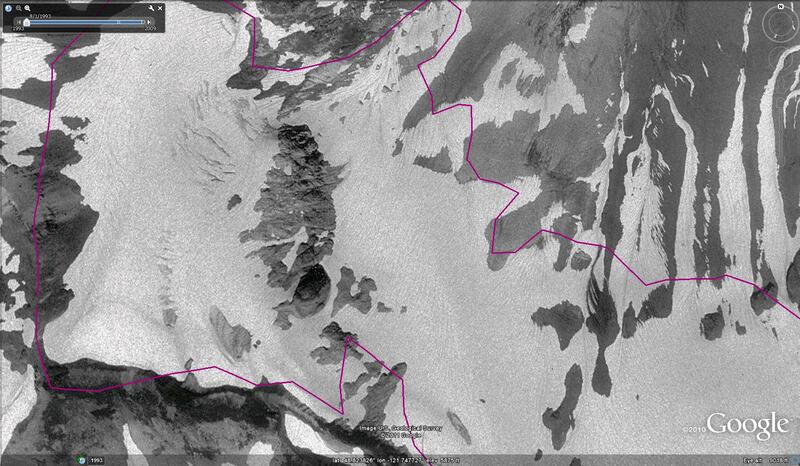 A closeup look at the terminus region illustrates not just retreat, but thinning as well when comparing the 1993 and 2009 imagery. The locations of thinning are shown by M thumbtacks in the bottom image. The terminus remains thin even on the steep slope as seen in the 2005 image of the terminus below. Above the terminus the steep slopes are typically well snowcovered into August as in 2007 second image. In 2011 a La Nina winter was predicted to lead to substantial snowfall and a cool winter inn the Pacific Northwest. The first half of the winter did not live up to the forecast, but the second half right through April did. The result is extensive snowpack. 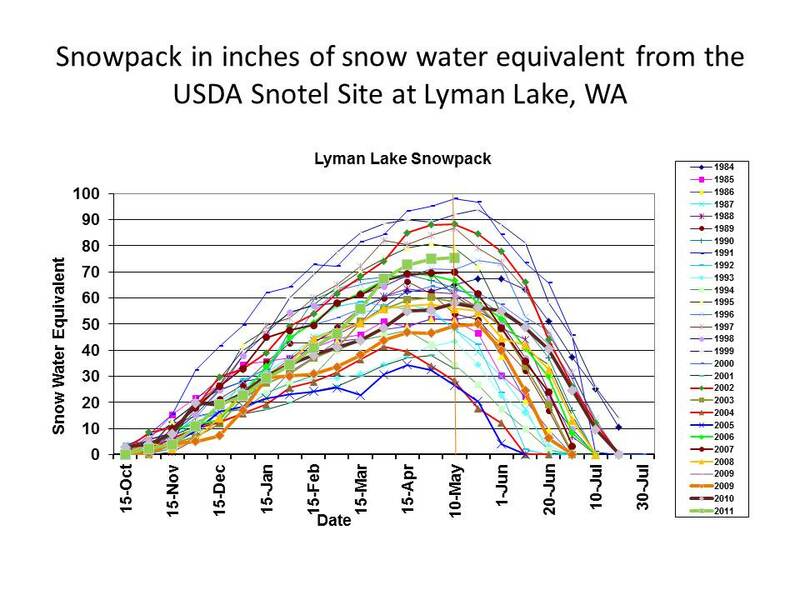 A comparison of the snowpack at Lyman Lake the best high altitude site that the USDA Snotel system has in the North Cascades indicates that as of May 10 the snowpack is quite high in 2011 (bottom image). It is not unusual at this site to have snowpack not decline significantly before May 20. 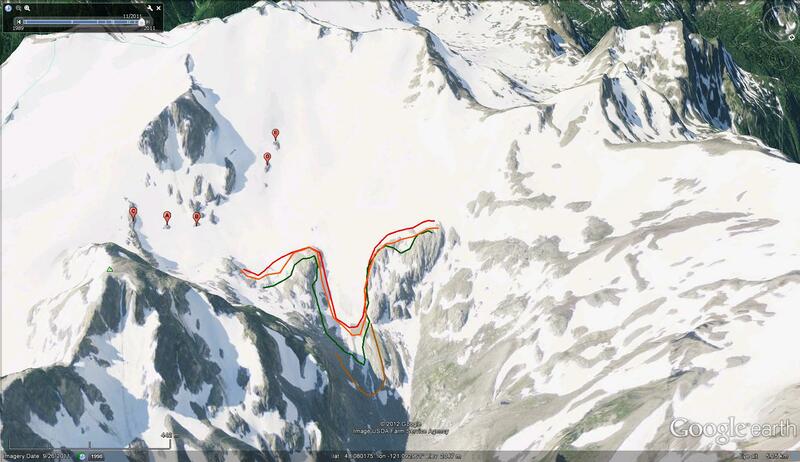 This suggests that summer will not feature a substantial melt out of the Ptarmigan Ridge Glacier. This is my daughter Jill’s favorite field area and this year maybe we will not have to paint on a positive mass balance. The Banded Glacier on Mount Logan in the North Cascades of Washington has retreated since 1960 creating a new alpine lake. 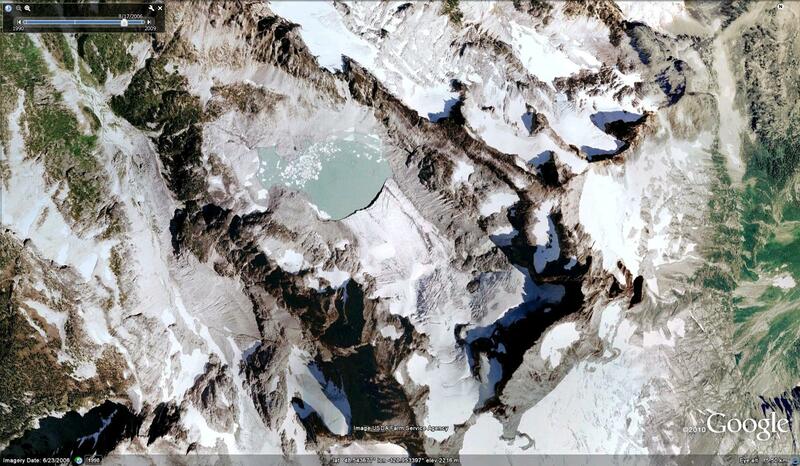 The glacier has retreated 450 m in from 1960 to the 2006 satellite image expanding the proglacial alpine lake. This glacier is retreating as are all North Cascade glaciers. The 1960 image is from Austin Post (USGS). The 2006 image has a blue dotted line at the 1960 terminus. 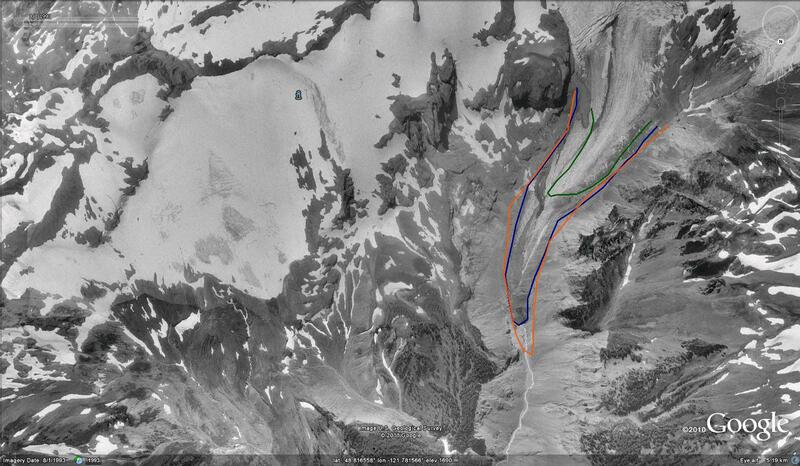 Note the spread of rock outcrops in the accumulation zone suggesting this glacier will have trouble surviving, a blue arrow indicates the new rock outcrops..The glacier has lost 40% of its area in this 46 year period. The north side (left side in the image) is very short at this point. The new lake has a number of icebergs in it. The number of crevasses has also diminished as the glacier has thinned, become shorter and as a result moves slower. The images below are from 1960, 1998, 2006 and 2009. The retreat from 1998-2009 is 270 meters. The slower movement is despite an increase in surface slope as the glacier has retreated from the flatter lake basin area onto the slopes leading to the summit of Mount Logan. This glacier is difficult to view unless you are right in the basin where it is. 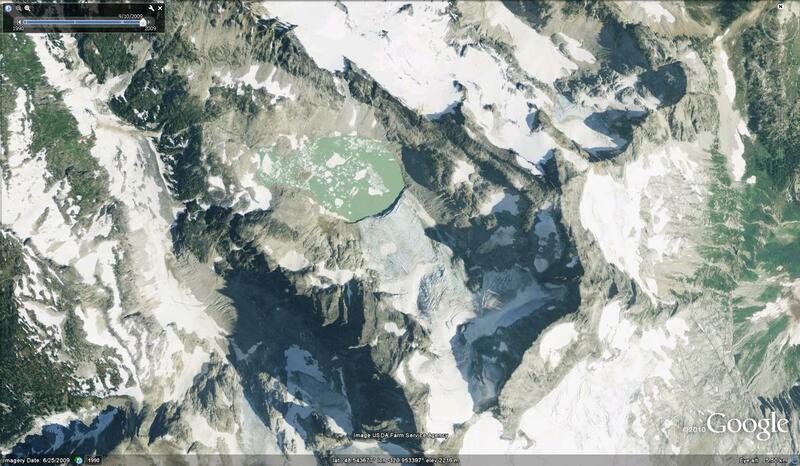 In 2005 and 2009 this glacier lost almost all of its snowcover, not a good sign for a glacier to survive.